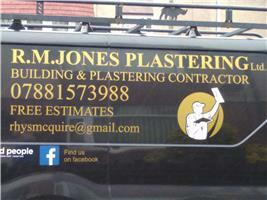 R M Jones Plastering and Building Contractor Ltd - Plasterer based in Abergele, Clwyd. Invoice history based on 14 reviews. We are R M Jones Plastering and Building Contractor Ltd we have been trading for 10 years. We are a family run business covering all of North Wales. We are fully qualified and insured in all aspects of plastering work. No job is too big or too small, we strive for perfection in every job we do. We provide a friendly and professional service with free estimates. We look forward to hearing from you.